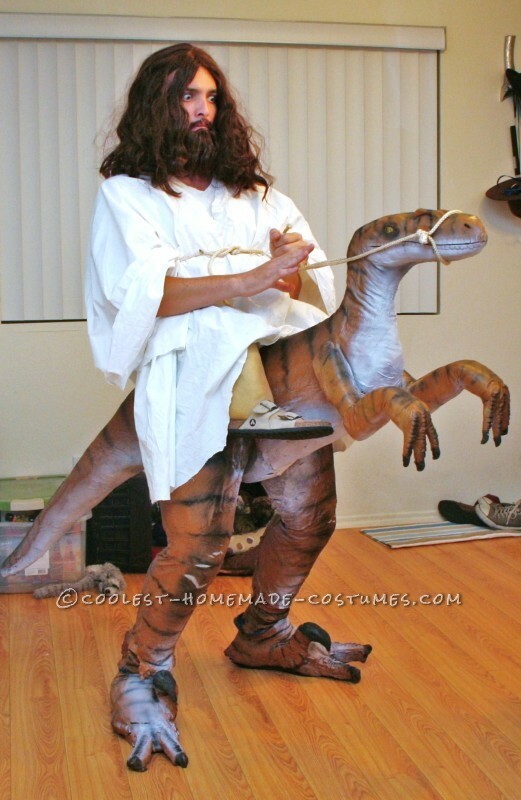 I wanted to make a challenging costume this year, and my roommate, Gregg, came up with the concept of Jesus riding a Raptor. The idea was funny and poignant [and potentially offensive] enough to be worthy of the effort. Additionally, it presented an opportunity to sculpt/create a large-scale creature, which was something I wanted to add to my portfolio for a while now. I sat down and did a quick character sketch for Gregg, so we could both get a visual on how it would look and how we might begin building it (and for cheap). And so began the ±100 hour construction of a raptor costume/miniature Jesus costume. Can I get an Amen? 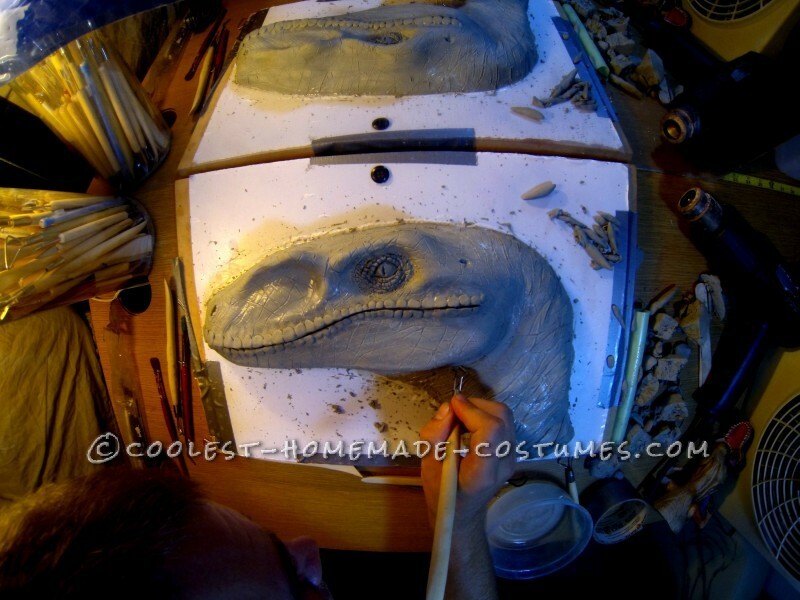 Step 1: I drew a full-sized outline of the raptor onto a large chunk of 6” deep foam, and cut out the shape using an electric knife. The electric knife cuts the foam like butter, and I was able to sculpt a semi-rough model of the raptor. Unfortunately, my electric knife stopped working due to internal mechanics, and I was forced to cut the rest of everything with scissors. Step 2: Next, out of Plastilina clay, I sculpted the left side of the raptor’s head; a 7 hour sculpt. I used a heat gun to warm the clay to a more malleable state. I made a mold of it in plaster of Paris, removed the clay, and made a latex cast of the head. Since the costume would be worn by my roommate and I would be out of town for the first 2 weeks in October, I figured I should get his help if we want to get this done by October 26th. For on that date, there was to be a costume party with a sizable sum of money as the prize for best costume (also, Robin Thicke performed there. He did not dress as Beetlejuice, unfortunately). In any case, we aimed to win that prize. Step 3: The night before I left for my 2 week holiday, I sculpted a 20”x 20” raptor skin texture in clay, and also molded it in plaster of Paris. It was up to Gregg to unmold the clay, and cast a [speculated] 8 count of latex skins. 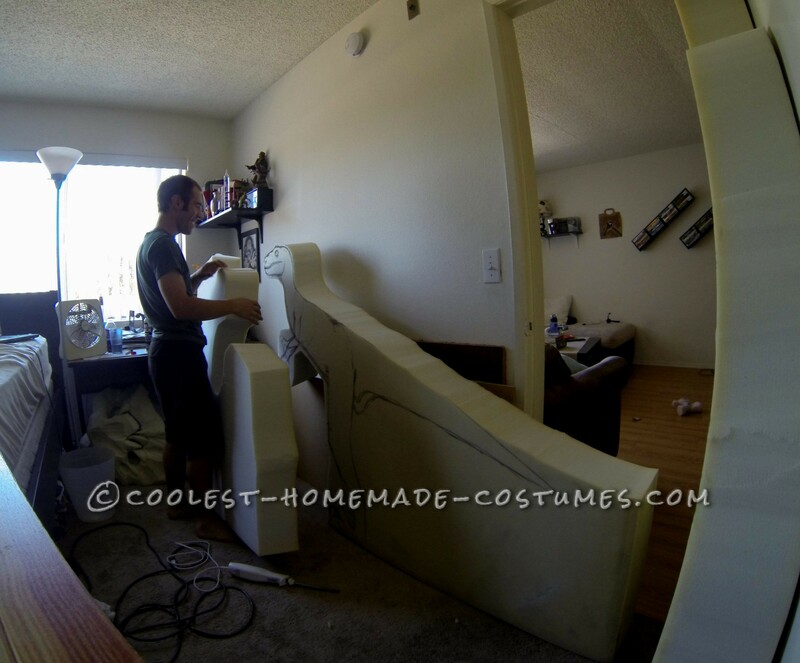 These latex skins would hold the details while being covering the foam body. Side note: Ideally, with more clay, I would have been able to sculpt the whole raptor and then make a giant latex ‘mask’ of the whole thing to cover the foam body. But, alas, as things were, with severely limited time and resources, the skin patch method would have to do. So while I was on my trip, Gregg labored away, spreading layers upon layers of latex into the plaster mold I had left. He also gathered all the elements for the Jesus portion of the costume: white sheet from Goodwill for his robe, long wavy brown wig, long brown beard wig, and sandals for his fake feet. 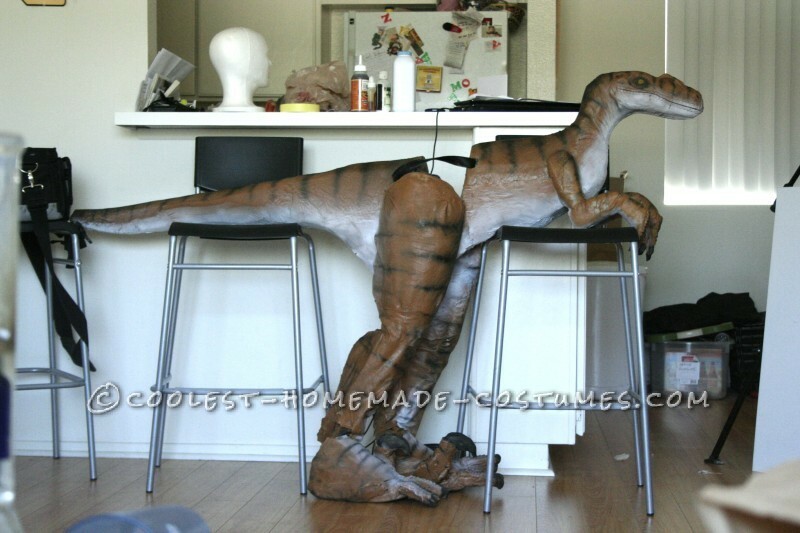 Since it was to appear as if he is riding atop the raptor, he would need to have some indication of a leg so to mask the fact that his legs are the raptor legs. 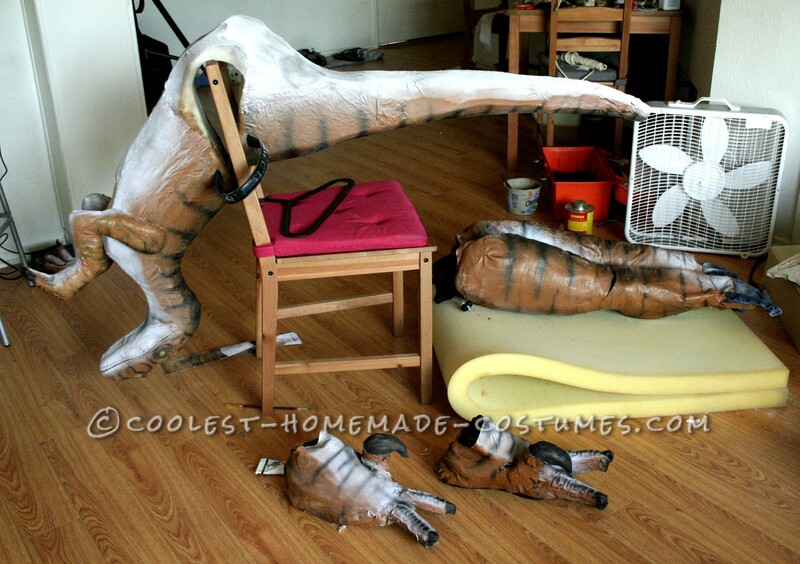 He cut foam into small leg shapes, put 2 layers of pantyhose over top, and sewed in the toes. He attached duct-tape loops to them to slip a belt through, and the belt held the fake legs to his “waist”. Step 4: Upon my return on Sunday the 20th (6 days before the party), I immediately started sculpting the right side of the raptor’s head. It was only a 5-6 hour sculpt this time because I had already developed the design of the raptor’s face. 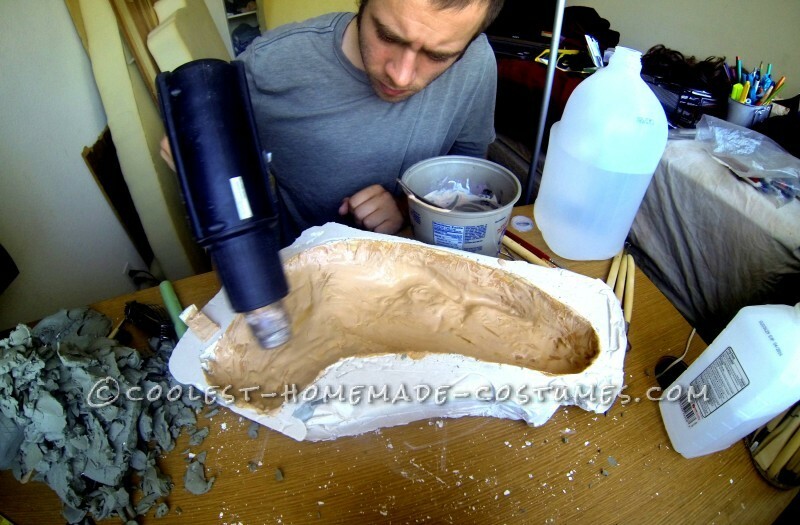 Again, a plaster mold was made, and a latex raptor half-face was cast. To make the legs, Gregg put on an old pair of tight jeans and we rubber cemented foam thighs and hind-leg pieces to them, before pulling tights over top of the whole thing. Foam was cut and rubber cemented to an old pair of shoes to make the feet. Latex skins were then adhered to the foam using rubber cement. While latex was originally going to be used to stick the skins to the body, our latex supply was dwindling and needed to be saved for blending the seams. Rubber cement proved to be tricky because its potency would weaken the already thin latex skins, and they would rip if extreme care was not taken. The determined method was to dab a minimally sufficient amount of rubber cement until it became tacky; gluing 1 side of the skin; pinning it and waiting for it to dry; then stretching to the desired position and dabbing and pinning. The arms, feet, legs, and body were all skinned this way. The seams were blended using the rest of our latex supply. Slits through the front and back of the raptor’s mid-section opening allowed for a belt to hold its entire body up, as if it is an oddly-shaped pair of pants that extended forward and backward from your waist. Step 5: October 26th, the day of the party. Cutting to the last minute, I awoke and painted the whole raptor with an orange-brown base coat of LiquiTex acrylic paint. The white on the stomach and black stripes on the back were added using airbrushed liquid acrylic. The glowing yellow eye was hand-painted. In my opinion, the paint job saved it. Hiding the seams is a key part to pulling off a good effect, and since we were so rushed with limited materials, such an extensive task had to fall by the wayside. By painting it all the same base color and adding an aesthetically loud pattern, the eye was shifted away from the once visually dominant seams. The pants were stuffed with dirty laundry so they could maintain their actual shape while they were being painted. That night, the beard and hair were trimmed, and a bridle for the raptor was made out of a combination of buckles and the same rope used to tie Jesus’ “waist” in. After a week solid of wicked late nights, costume was finally finished and looked absolutely stunning. At the door to the party, the bouncer told Gregg his was the best costume he’d seen so far. Fun, dancing, and overpriced beers ensued. There were a tonne of really great costumes, and even though we didn’t win the contest, Gregg must have taken pictures with well over 50 people. Everyone thought it was hilarious, and a good time was had by all. Plus, there’s always next year. Until then, maybe I’ll just wear the costume around Hollywood and take pictures with tourists. A lot was certainly learned on this epic undertaking, and I hope my lengthy explanation passes on some of that knowledge to you. 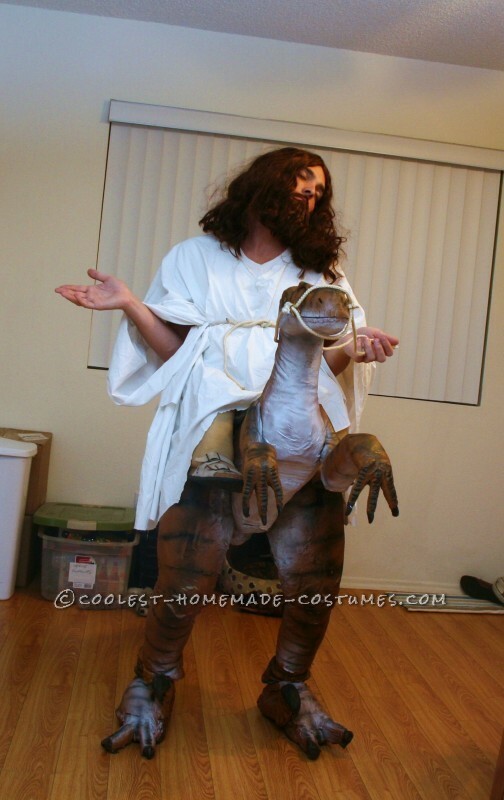 As for materials and cost, the Jesus riding a Raptor costume was mostly constructed from stuff I already had (such as the latex, paint, and the massive amounts of mattress foam I acquired for free), but cost me under $30 in the additional purchases of plaster of Paris and rubber cement. The sheet, wig and beard were another $35 or so. Tallest Fire Breathing Dragon Costume Ever!